Humble Student of the Markets: An opportunity in EM stocks? The latest BAML Fund Manager Survey shows that institutional managers have been piling into emerging market equities while avoiding the other major developed market regions. Indeed, there is good reasoning behind the bullish stampede. 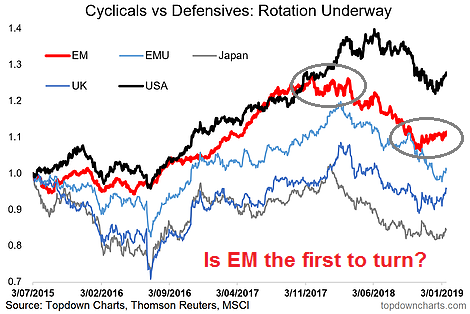 Callum Thomas showed a series of charts supportive of the EM equity bull case. 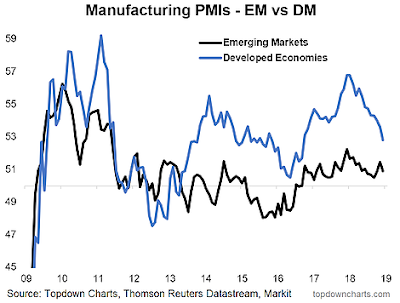 For one, developed market M-PMIs have been falling while EM PMIs have been mostly steady. 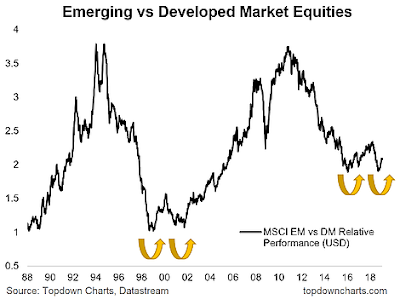 On a relative basis, EM/DM equity performance are showing signs of a long-term double bottom consistent with the double bottom pattern of the last cycle. 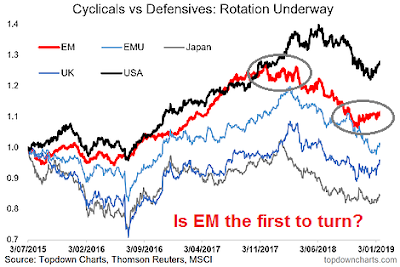 The cyclical to defensive stock ratio in EM appear to be bottoming. This ratio led the downturn, could it be signaling a risk-on revival? Should you follow suit into EM stocks?